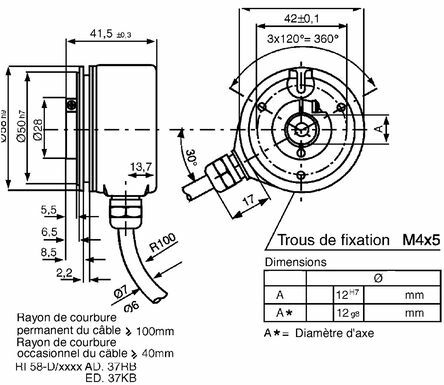 Encoders with diameter of 58 mm, for direct mounting at end of motor arm. Reduced housing depth for highly compact mounting. Simplicity and safety of coupling to the shaft thanks to the use of a concentric clip. High precision of output signals for use in the most demanding applications. Use of Opto-Asic technology for greater reliability and protection against electrical and electromagnetic interference. Integrated control circuitry with alarm output. 3 channels (A,B,Z) for 10 to 30 V dc power supply model. 200 kHz for 10 to 30 V dc power supply model.